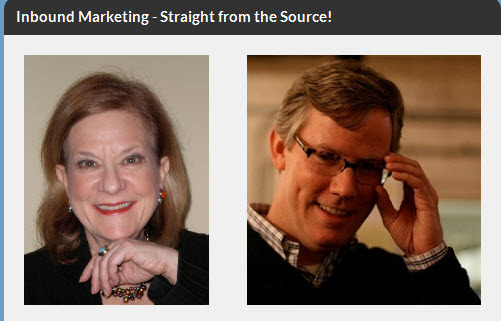 For an hour on Friday, I interviewed HubSpot CEO Brian Halligan when I guest-hosted the LinkedIn Lady Show on Internet-based RockStar Radio Network for my friend Carol McManus. It was a rare opportunity for all of us to learn about the current state and future direction of Inbound Marketing from one of the acknowledged leaders of marketing thought and action today. After I complained that I haven’t been able to come up with a one-liner to define Inbound marketing, Brian empathized, saying he’s only been able to get it down to about four or five lines. Inbound Marketing is the opposite of traditional outbound marketing (advertising, direct mail/phone, tradeshows, etc. ), where you interrupt your way into your people's lives. Instead of interrupting, Inbound Marketing pulls prospects into and down through your sales funnel in a new and natural way based on how they search for information and make purchase decisions today. Brian compared the shift in marketing today as similar to the shift in transportation that came with the automobile. Whoever decided to keep on selling buggies, horses and whips wasn’t around too long after the public started buying cars. He and I agree that it’s still pretty early in the Inbound game and a moment of opportunity for those who jump in now. But it’s a window of opportunity that won’t last too long, Brian Halligan predicts. The hardest part of Inbound Marketing, he believes, is pulling prospects into the top of the sales funnel and converting them to leads. That’s the part that takes creativity and persistence – developing great content and getting calls to action and landing pages just right. Once visitors convert to leads, nurturing them and pulling them through sales funnel can be more mechanical. He and his co-founder Dharmesh Shah have built into HubSpot the functionalities to automate the lead nurturing process and make it efficient. Make the time and free the resources to create great content by stopping marketing efforts (like Google Adwords, Advertising, Tradeshows) that don’t drive as strong results. The trip through the sales funnel is not linear. Leads can bounce up and down between different levels. HubSpot was created not just to sell software, but to give customers the knowledge they need to transform their marketing. An hour with Brian Halligan is an hour well spent for any marketer or business owner. I hope you’ll take the opportunity to listen to the full interview. And while you’re here, please download our free fact sheet that details 20 reasons you should consider transforming your marketing with HubSpot.